Friday, September 25 1908 -- As the bond-fixing scandal of the Solid Three grinds on, Herriman dramatically reminds readers to never let such political tampering happen again. Great cartoon, but too bad George doesn't have any definite suggestions on how exactly to accomplish that end. Connie, October 23 1938, courtesy of Cole Johnson. Frederick “Fred” Schwab was born in New York, New York, on August 25, 1917. His birth date is from the Social Security Death Index, and other sources confirm the year, such as his military enlistment, a public record at Ancestry.com and census records. Sources that have his birth year as 1920 are incorrect. Volume one of Contemporary Graphic Artists (1986) has a excellent profile of Schwab despite the birth year error. In the 1920 U.S. Federal Census, Schwab was the only child, age two years and four months, of John, a baker, and Josephine. They lived in Manhattan, New York City at 238 East 89th Street. His father was Austrian and his mother Hungarian. Contemporary Graphic Artists had the same names for his parents, and parenthetically noted that his father was a painter. In the following census the family remained in Manhattan but at a different address, 50 West 93rd Street. Schwab was twelve years old and had a sister, Wilhelmina. According to Contemporary Graphic Artists, Schwab’s comic book career began in 1936 as a staff artist at Chesler Publishing Company. Walking around midtown Manhattan, approximately nineteen-year-old Schwab saw a sign that read, “cartoonists wanted,” and entered the office. The man asked Schwab what his favorite drawing subject was. When he answered cowboys, a western script was handed to him by Harry “A” Chesler. The 1940 census recorded Schwab as a cartoonist residing with his parents and sister at 1741 York Avenue in Manhattan. He had four years of high school and, in 1939, earned a thousand dollars working for publications. 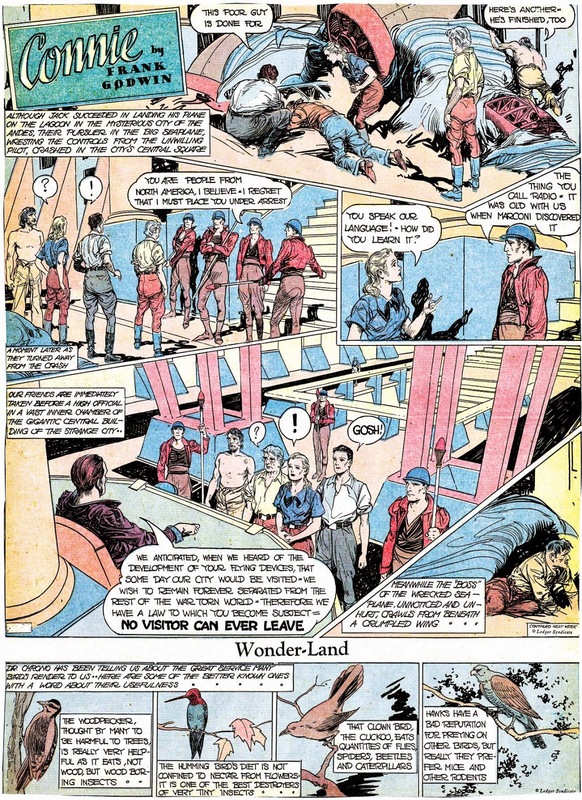 In 1938 he left Chesler and freelanced in the comics industry until 1942. On January 6, 1942, Schwab enlisted in the army at Fort Dix, New Jersey. His record said he was single and a commercial artist who had four years of high school. He stood five feet eight inches and weighed 148 pounds. According to Contemporary Graphic Artists, he served in the Air Force from 1942 to 1945, and drew cartoons for the newspaper Yank and posters for the Air Force. 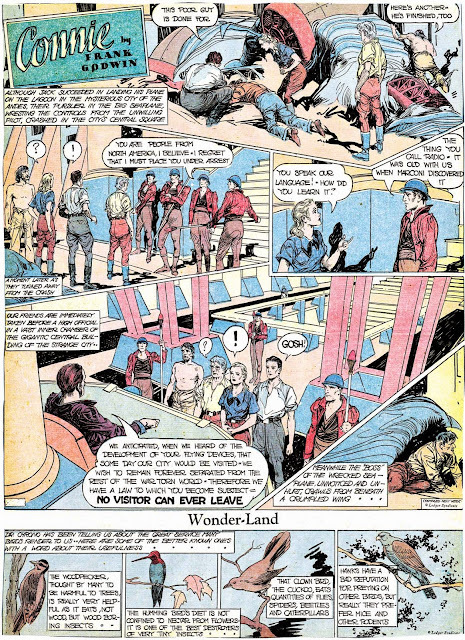 After the war he attended the Art Students League from 1946 to 1947, and returned to freelancing as a comic book artist, cartoonist, and advertising illustrator until 1960. For the next twenty years he was a New York Times staff artist. Then in 1980 he returned to being a freelance cartoonist and advertising artist. Schwab was the fourth and last artist to draw Lady Luck, from May 5 to November 3, 1946, which was a backup feature in the Spirit comic book insert. He was preceded by Chuck Mazoujian, Nick Cardy and Klaus Nordling. On April 1, 1956, Schwab married Barbara Frick. Their engagement was reported in the New York Times, February 2, which said he attended New York University. Contemporary Graphic Artists did not mention the university as part of his education. A 1976 public record at Ancestry.com said his birth was August 25, 1917 and address at “411 E 53rd St Apt 15j, New York, NY, 10022-5112.” Essentially the same address was in Contemporary Graphic Artists. Jack Cole and Fred Schwab are two of my favorite artists. Before he got onto Plastic Man, Jack Cole used to work side-by-side with Fred, and Fred said they used to try to top each other with crazy ideas. Who could do the craziest, most far-out stuff. Fred was just marvelous. I wish he could have continued in the direction he was going with his comic book stuff because it was just fantastic. 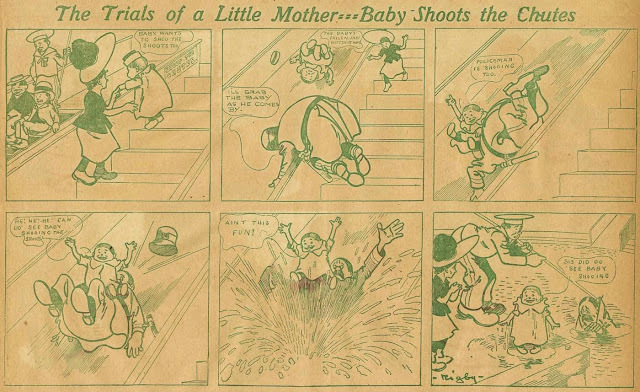 He worked for Harry Chesler on some of the very earliest comics, and he worked for Charlie Biro for awhile and then did filler pages all around the field, two- and three-, four-page stuff. It was sort of an outgrowth of E.C. Segar’s style on Popeye. The characters were just crazy. He did Herlock Sholmes and Doctor Potsam, I remember some of his stuff was so awful. The puns were bad. There was one character that was a walking pun. That was Cowboy Jake of the Bar-Mitzvah Ranch. All the horses would have patches on their rumps. Fred worked for Will [Eisner], some. He always did some worked for Will. I think he did Lady Luck for a little while, in addition to Klaus Nordling. Nordling did most of it after Nick Viscardi and Chuck Mazoujian were off the thing. But Fred would come in, occasionally, to Will. I never met him then, but I know he kept in touch with Will. Then he dropped out of the comics altogether and took a staff job with The New York Times. He worked in their art department for many, many years. …As for cartooning I am self-taught. I rely upon my sense of humor for ideas. I’ve never taken life seriously; I see humor in everything, in life’s errors, absurdities, pretensions, discomforts, embarrassments, as well as in its inherent unpredictability. All these may appear tragic to some, they seem comical to me…. Schwab–Fred, 82, of 411 East 53 Street died on May 13, 2000. Mr. Schwab was born educated and resided in New York. He served in World War II as a photo journalist. 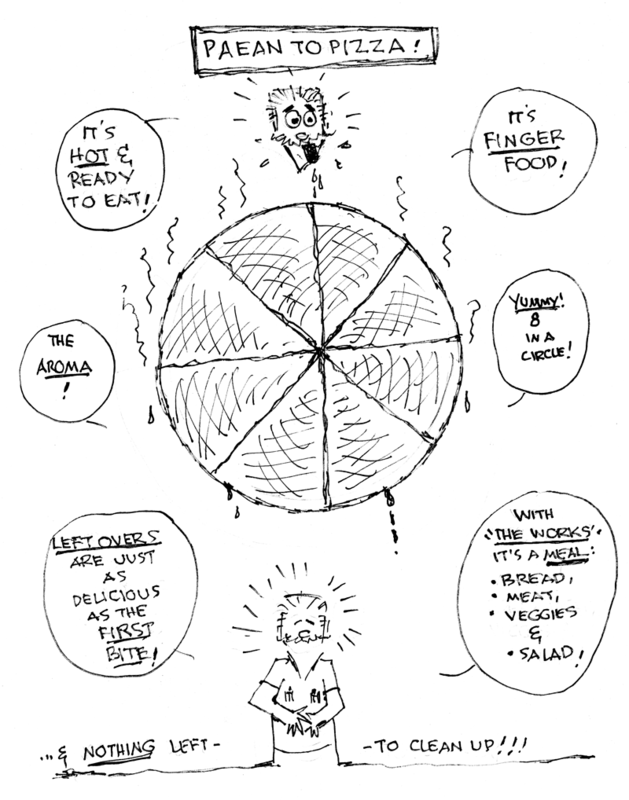 He was a retired graphic illustrator for the New York Times and a freelance cartoonist. Mr. Schwab was the widower of Barbara Frick and is survived by his niece Rosemarie Sankowsky of Wayland, Massachusetts. A private family service was held last week. Schwab–Fred. The New York Times records with deep sorrow the passing of Fred Schwab, associated with The Times from 1947 until retiring in 1979. 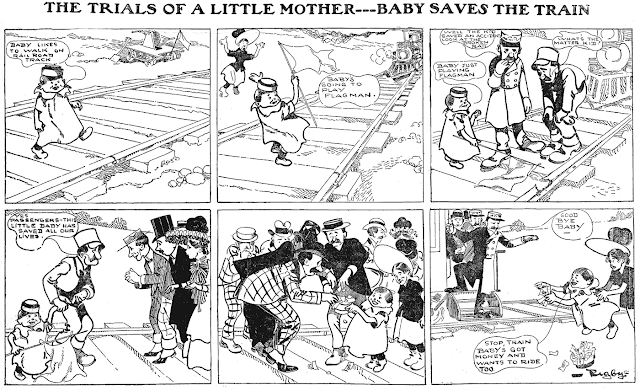 Precocious babies have often figured into newspaper comics sections. There's the first comic superstar, the Yellow Kid, of course, and dozens more over the subsequent decades. 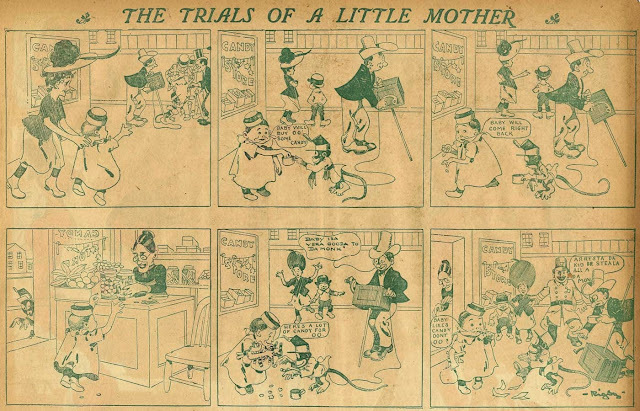 Here's an entry titled The Trials of a Little Mother from journeyman ink-slinger Clarence Rigby, which appeared in one of the McClure pre-print comics sections from March 29 to September 6 1903, and was then reprinted occasionally in their sections from 1906 to 1908. 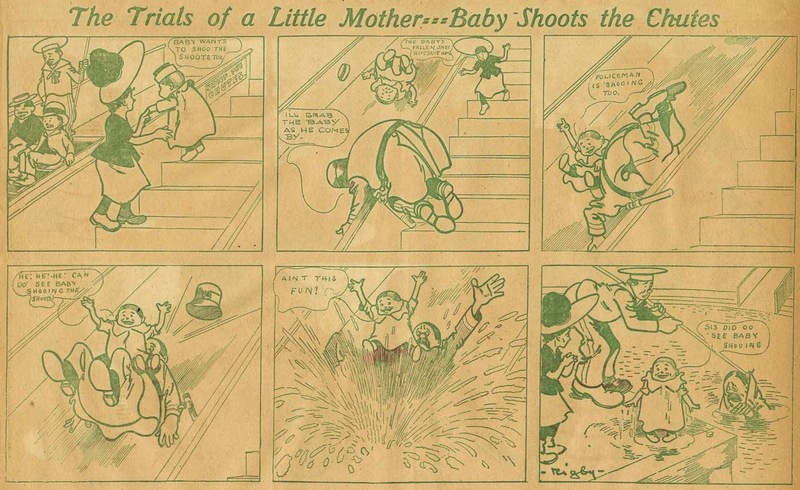 Sometimes the strip goes with the obvious sort of gag where the baby causes a catastrophe, but other times Rigby takes the more interesting tack and has the baby save the day, like in the middle example above. Charles John “Chuck” Mazoujian was born in New Jersey on August 24, 1917. His full name and birth date are from the Social Security Death Index, and his birthplace was recorded on his World War II army enlistment. In the 1920 U.S. Federal Census, he was the second of three sons born to John and Rosa, both Armenian emigrants. They lived in West Hoboken, New Jersey at 915 Highpoint Avenue. His father was a photo-engraver. The next census recorded Mazoujian, his parents and younger brother in West New York, New Jersey at 21 20th Street. Mazoujian attended Pratt Institute in Brooklyn, New York. In the school’s yearbook, Prattonia 1939, next to his graduate photograph (above), it said: “Mazoujian, Charles, Pict. Illus., 21 20th St., West New York, N.J….Artsmen Basketball ’36, ’37, ’38, Artsmen Athletic Director ’38, ’39, Prattonia Rep. ’38, ’39.” In 1937, three of his classmates in “Illustration I A” were William Bossert, William King and Roderick Parkinson, all future comic book artists. Mazoujian’s graduating class included John E. Ayman, William Bossert, Lillian Chestney, Charles Nicholas Cuidera, Philip J. Dring, Robert H. Webb and Stanley M. Zuckerberg; all of them would work in the comic book industry to some degree. Mazoujian was at home with his parents and older brother in the 1940 census. ...when I left Eisner-Iger, three artists agreed to come with me: Bob Powell, Chuck Mazoujian, and Lou Fine. We opened a studio in Tudor City. And then Nick Viscardi came along, and Dave Berg and Chuck Cuidera. Cassell: It sounds, at least for those of us looking back on it now, as if that must have been an exciting time to be involved in comics. Eisner: Well, you know, everybody refers to the period as the Golden Era. For me, it was the Leaden Era. Everybody was working hard. Most of the guys in the shop were working to just make some money so they could go uptown. Chuck Mazoujian was the first guy to leave and he went uptown to become an art director and illustrator and a good painter….Uptown meant going to a major advertising agency…. 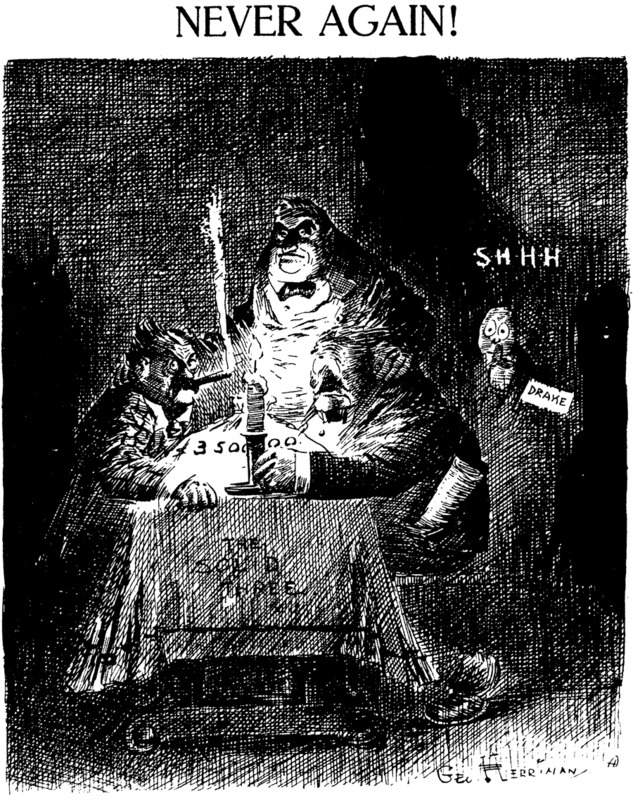 Before Mazoujian left Eisner, his contribution was Lady Luck which appeared as a backup feature in the Comic Book Section Sunday supplement whose main feature was The Spirit. It debuted June 2, 1940. 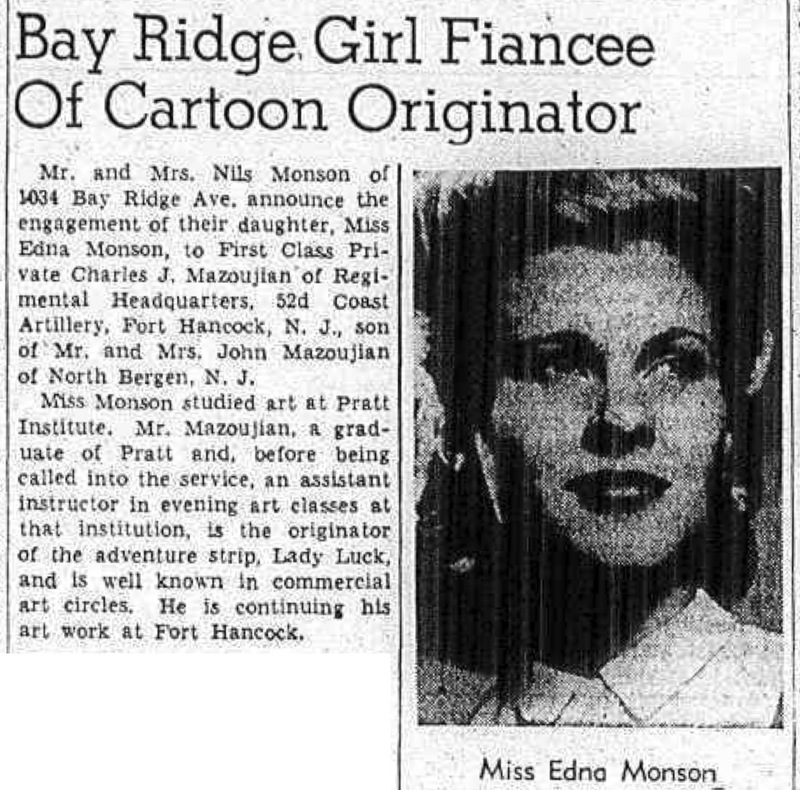 The Record and Herald News (New Jersey), March 27, 2011 said: “…he created the ‘Lady Luck’ comic originally modeled after his fiancée, then Edna Monson, who wore a stylish green hat.” According to American Newspaper Comics (2012), Mazoujian’s run ended May 11, 1941. Bay Ridge Girl Fiancee of Cartoon OriginatorMr. and Mrs. Nils Monson of 1034 Bay Ridge Ave. announce the engagement of their daughter, Miss Edna Monson, to First Class Private Charles J. Mazoujian of Regimental Headquarters, 52d Coast Artillery, Fort Hancock, N.J., son of Mr. and Mrs. John Mazoujian of North Bergen, N.J.
Miss Monson studied art at Pratt Institute. Mr. Mazoujian, a graduate of Pratt and, before being called into the service, an assistant instructor in evening art classes at that institution, is the originator of the adventure strip, Lady Luck, and is well known in commercial art circles. He is continuing his art work at Fort Hancock. While in the service Mazoujian’s art garnered attention. The New York Sun, January 9, 1942, said he was awarded fifth place in “Life in the Service” exhibition sponsored by the Hobby Guild of America and shown at Bloomingdale’s. The Richmond TImes Dispatch, (Virginia), January 23, 1942, said: “Outstanding among the pencil work is that of Private First Class C.J. Mazoujian, stationed at Fort Hancock, N.J. He depicts Army life on maneuvers in several pieces.” Some of those drawings were featured in Life magazine, February 9, 1942. Nine years later, Mazoujian provided two pencil drawings for Life, December 3, 1951, here and here. After the war, the Record and Herald News said he returned to Pratt Institute to teach painting and figure drawing evening classes. His freelance illustrations appeared in many books. He was an illustrator for the New York advertising agency, Ogilvy and Mather, in the early 1960s. At some point he retired. His wife passed away October 3, 1992. According to telephone directories at Ancestry.com, during the 1990s Mazoujian lived at 20 Brook Road in Tenafly, New Jersey. Beginning in 2002, he lived with his son, Craig in Tucson, Arizona, then in 2007 with daughter, Gwen in Sacramento, California. Mazoujian passed away January 14, 2011, in Sacramento, California. 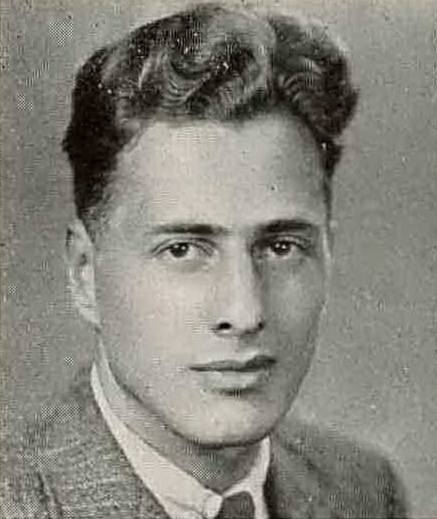 His death was reported March 27 in the Record and Herald News. An overview of his career is here, and his comic book credits are here. He also did a terrific spread illustration for Will Eisner at his first editorial war gig, Firepower. So they did join up, even though Chuck had gone into the army earlier. 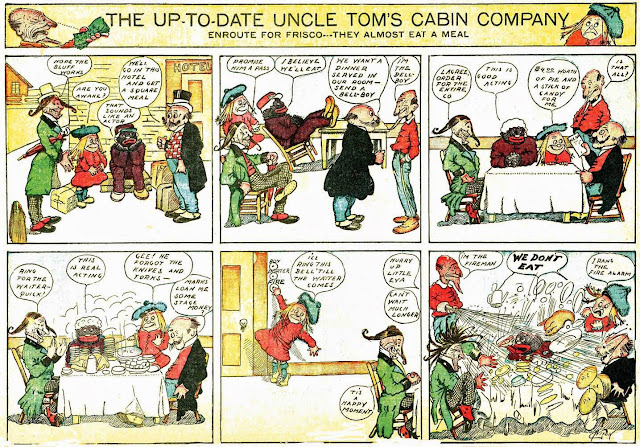 In 1905, when World Color Printing's boilerplate color comics section was becoming a very popular option for medium-sized newspapers -- those too poor to have color presses or to purchase the higher end products from Pulitzer or Hearst -- a promising newcomer named Nixon came onto the scene. 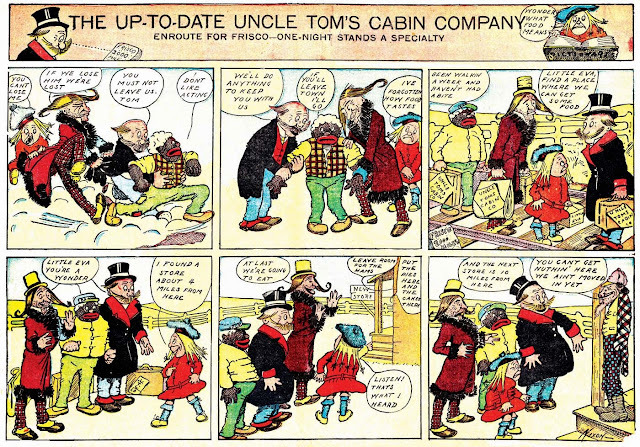 No, no, not that fellow who could find Commies under every bed in America, but a looney-toon of a different stripe who submitted some very wacky comic strips to the growing syndicate. The Up-To-Date Uncle Tom's Cabin Company follows the harrowing story of a two-bit troupe of actors trying to get from the east coast to San Francisco, where they hope to play a gig. The troupe apparently limits their repertoire to stage adaptations of Harriet Beecher Stowe's classic novel, and so they travel with a black actor to play the title role, and a young girl (maybe a midget?) to play the angelic Little Eva. They haven't a cent to their name, so transportation is by foot, food is as scarce as finding a free meal, and perhaps worst of all, the star of the show does not want to be an actor and is constantly trying to escape. Mr. Nixon's cartooning and writing skills are certainly in their awkward teenaged years here, but he shows an innate if somewhat primitive genius for the form. I have little doubt that if he had stuck to newspaper cartooning, he would have produced a lot of memorably crazy material in an era when that sort of thing was welcomed in the funnies section. 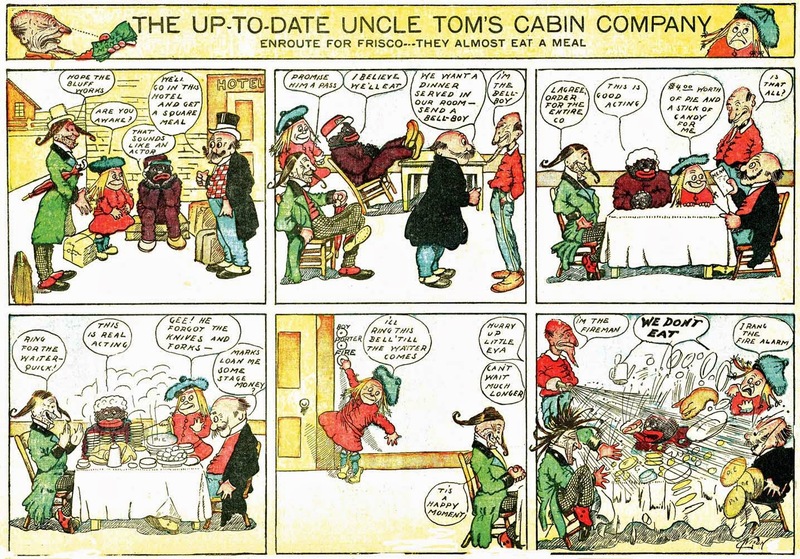 The Up-To-Date Uncle Tom's Cabin Company ran in the WCP comic sections of February 26 to April 2 1905. Thanks to our late benefactor Cole Johnson, who supplied the scans. Another one of those early comics in which the balloons read right to left.